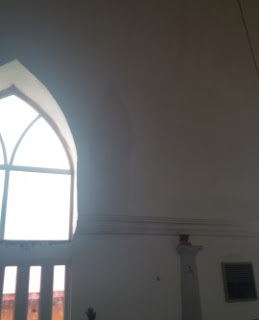 Catholic church members who worshipped at St Benedict Catholic Church in Ubiaja city in Edo State said they have spotted another apparition of Virgin Mary on the wall. According those who witnessed it yesterday, an apparent image of Holy Mother Mary was seen during morning mass at the aforementioned church. The members who snapped the pictures said it’s real. Just this past year around January, the apparition of virgin mother Mary was sighted on a church wall in the Philippines (See the pictures here). 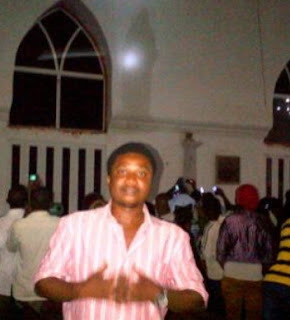 This attracted thousands of catholic faithfuls to the holy scene as they look in awe. Did anyone witness this in Edo state yesterday? How true is it? glory to Jesus, honour to Mary. dear catholic brethren and Christians as a whole, there’s really no need for all these argument. this division in the church is a plot from the pit of hell. notwithstanding, I believe the church that Christ himself started can never be wrong. the act of the apostles can never be wrong as well. many speaking against the church of Christ are in no way different from the Muslims or other unbelievers. because many speak the opinions of their pastors or prophets who decides to have his or her own followership by criticising what is on ground. God will always remain faithful, He will always hear our prayers anywhere we call upon Him. be it in our bedrooms or in any church but that notwithstanding, we should not neglect the mode of worship He has laid down for us through our Lord Jesus Christ. I believe in God, I believe in Jesus Christ, I believe in the Holy Spirit, I believe in the one Holy church. For us who believe in the Church started by Jesus Christ and the act of His apostles, I say a big congrats. hold on to your faith. some of us need to trace your step to your source. Glory to Lord Jesus, honour to mother Mary.